Say Nothing by Brad Parks (above) recently was featured on the front table of every Barnes & Noble in the U.S. Parks will be the guest at a new book launch party at 5 p.m. today, April 6, at the Lancaster Community Library, 16 Town Centre Drive, Kilmarnock. Signed copies of Say Nothing will be available for purchase. 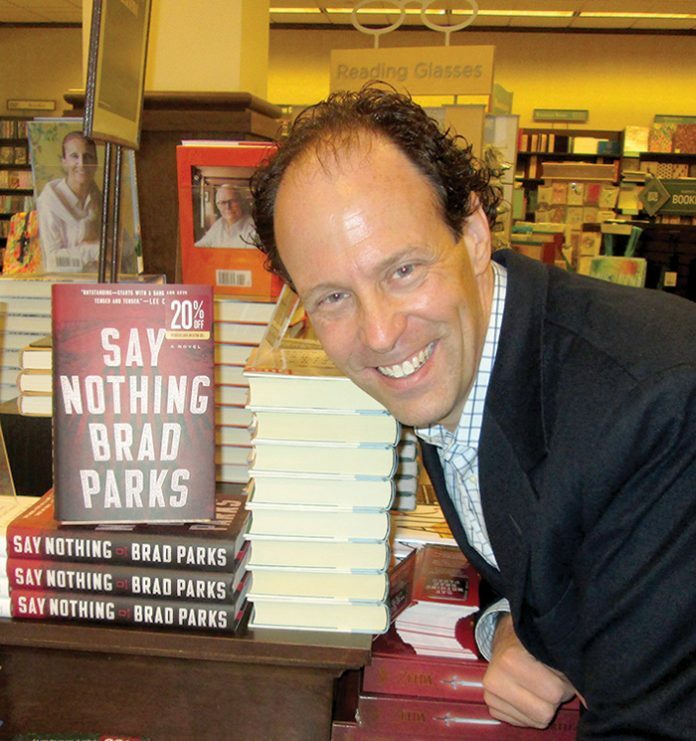 Award-winning author Brad Parks will make three area appearances this week to celebrate the release of his seventh novel, Say Nothing, a crime thriller set in and inspired by the Virginia tidewater. Parks will be at Lancaster Community Library at 5 p.m. Thursday, April 6; at Christopher Newport University’s Yoder Barn at 3 p.m. Friday, April 7, and the Middlesex Women’s Club in Urbanna at 1 p.m. Monday, April 10. All events are free and open to the public. The main action of Say Nothing takes place in Gloucester County. There are also scenes set in Norfolk, Newport News and Mathews County. Parks, 42, lived with his family in Middlesex County for eight years and still maintains a part-time residence there. He wrote nearly every word of Say Nothing at his favorite writing haunt, the Hardee’s in Saluda. Local ties aside, the novel has already established a national—and even international—footprint. It was featured on the front table of every Barnes & Noble in the U.S. The UK edition was named Thriller of the Month by The Times of London. It will be translated into 12 languages and will sell in dozens of countries across the globe. The novel represents a significant literary departure for Parks, whose first six books featured an investigative newspaper reporter from New Jersey. The series collectively won the Shamus, Nero and Lefty Awards, three of crime fiction’s most prestigious prizes. Say Nothing is his first standalone. It details the saga of a federal judge whose children are kidnapped. It received a trifecta of starred reviews from three prominent pre-publication trade magazines-Publishers Weekly, Kirkus and Library Journal.